From 1941 to the low in 1974, the average annual compound return on the All Ordinaries Index for 33 years was 2.9 per cent per annum. Take off inflation of 4 per cent and you were going backwards. And that doesn't include 1929 to 1941, which would have pulled it even lower. 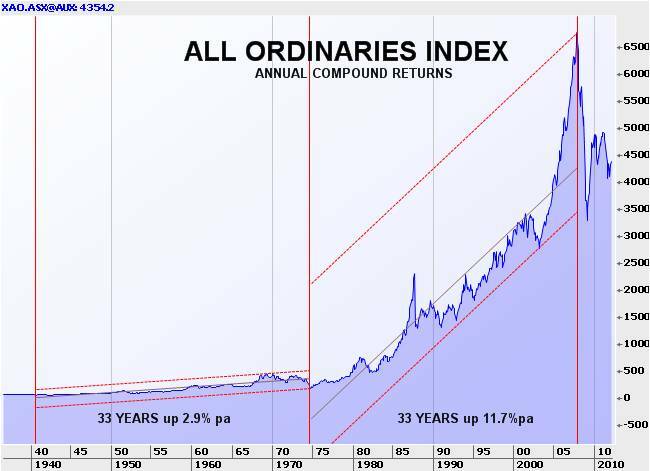 In the next 33 years from the 1974 low (yes I've picked my dates) to the 2007 high, the All Ordinaries Index delivered an average annual compound return of 11.7 per cent. Add in 4.3 per cent of dividends and you come up to 16 per cent, per annum, for 33 years. Strewth. No wonder everyone learned to set and forget, no wonder no one ever asked questions about fees, no wonder people didn't notice the trails on equity products even though the recipient was driving a BMW and the end customer got nothing for it, no wonder customers tolerated 2 per cent wrap account fees from big investment banks even if the money was invested in term deposits, no wonder the lowest risk asset allocation option on your managed fund still held 40-65 per cent in equities, no wonder the financial industry is so huge. It has been an incredible three decades of asset speculation and price appreciation driven by people spending borrowed money, and the question now is whether it can continue. It's a multitrillion-dollar question for equities globally, for all asset classes, and it is a question for the school-fees-burdened parent and the retirement-focused investor. We all need asset prices to go up because we have all been conditioned to expect it and our expectations, the root of all happiness, require it. We anticipate growth because for the past 33 years the property market and the equity market have always gone up. It's what we're used to. And now, for the first time I can remember (since 1982), we are seriously questioning it, whether this is our "Japan moment", our peak for the next 22 years, the pre-cursor to a period of massive volatility in which we have to duck and weave to make money because the average price goes down? Risk aversion rises and with it volatility. The risk-reward ratio shifts and you have to ask whether your risk-tolerance quotient, and we are all different, has been violated. If so step out. Not losing money is good now. Priority one, survival. Priority 100, stock market glory. Making money is going to take more effort. When it's more risky it requires more discipline and skill. Trading skills and in particular risk management (what's that?!) are an available commodity. You will have to learn some of them or you'll be wandering around on the battlefield wearing orange, and we'll get you. There is more focus on stocks than ''the market''. It becomes a "traders' market". Stocks become "good" or "bad" and sentiment more polarised on a stock-by-stock basis. There is less tolerance of disappointment and more focus on stocks that do well. News that defines a stock as good or bad starts a trend that will last longer. Perfect for traders. Terrible for those who still think that investment is about having ''faith'' in anything other than today's price. There is no long-term investment for the moment. You have to be more flexible. Having strong convictions about stocks or the market beyond tomorrow is misplaced arrogance. This is a time of flux. When the market is priced on risk and risk can change exponentially in a moment, Greece going bankrupt for instance, you can't realistically set investment horizons in advance. Without a reliable long-term ''uptrend'' you have to make money out of any opportunity over any time frame. Change your expectations. If the root of all happiness is expectations met, then set realistic ones. Not very cheerful I know, but those who are forced to lift their skills and education now will come out of this as much better investors and that is perhaps the best long-term investment you can make.